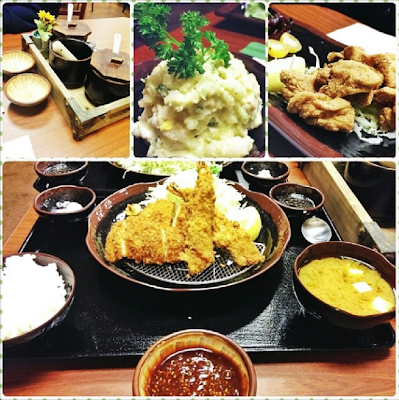 Tonkatsu Kiyoshi is a small Japanese restaurant that specializes in making tonkatsu, which is a breaded, deep-fried pork cutlet. I don't really eat much pork so I'm glad they also make shrimp katsu, salmon katsu, chicken katsu, and other Japanese dishes. I ordered the Japanese Style Potato Salad, Chicken Karaage, and Salmon and Shrimp Katsu served w/ a bowl of rice, miso soup, and Japanese pickles. If you want the ultimate comfort food, I highly suggest eating at Tonkatsu Kiyoshi! Other than the awesome food this small restaurant has a quiet, relaxed vibe.